WELL NOW, TALK ABOUT RARE, REAL AND BEAUTIFUL!! CALL JEFF 410-562-9319  Dream Car Sellers, LLC. REAL DEAL, TRIPLE BLACK ROADSTER WITH THE AUXILLARY MATCHING HARD TOP. 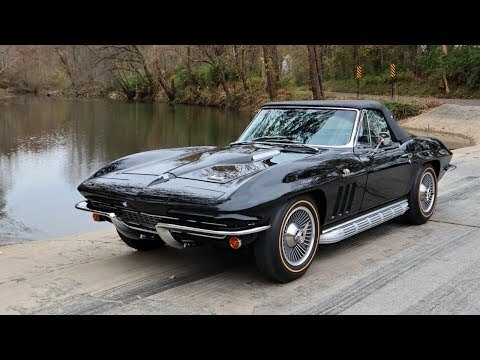 THERE WERE ONLY 1,190 BLACK CORVETTES PRODUCED IN 1966. THAT SPLIT UP BETWEEN COUPES AND CONVERTIBLES. HOW MANY IN TRIPLE BLACK? HOW MANY SURVIVING? MATCHING NUMBERS L-72, 427 / 425HP., 4 SPEED, POSI REAR, SIDE PIPES, GOLD LINES, KNOCK OFF'S. ITEMIZED RECEIPTS FOR ENTIRE RESTORATION! BEAUTIFUL RESTORATION FINISHED LAST YEAR ON A CAR CLAIMING A LITTLE OVER 12,000 ACTUAL MILES! MAYBE YOU WOULD CALL THIS ONE QUADRUPLE BLACK? WITH THE HARD TOP... TRIM TAG HAS BEEN VERIFIED. THE CAR DOCUMENTS ITSELF. SEE THE PICTURES. CURRENT OWNER HAS KNOWN THIS CAR SINCE 1969! VEHICLE IS LOCATED IN MISSOURI. CLICK ON THE LINK BELOW TO SEE ALL THE DOCUMENTING PHOTOS! Asking price: $117,500 - Get an Auto Loan in 1 Minute!